Shopping for a new apartment today should be as easy as booking a luxury vacation online. With the tools available to landlords, renters should be able to (in theory) rent an apartment sight unseen and feel confident about what they are leasing. One of the biggest challenges for renters with the influx of online ads in recent years, has been the lack of suite specific photos - which to most renters, are actually the most important pictures they can be shown. When you post your ad online, you're competing with hundreds of other units in your prospect's search. What factors are likely to sway them towards your rental? Location and price are significant elements, however, your competitors might have similar units in your location with similar pricing. So what are many renters using to filter properties they may or may not want to visit? Photos! They want to see where they will live and be able to picture themselves in that space. That exact space. Not a unit on another floor, with the opposite layout and someone else's furnishings. 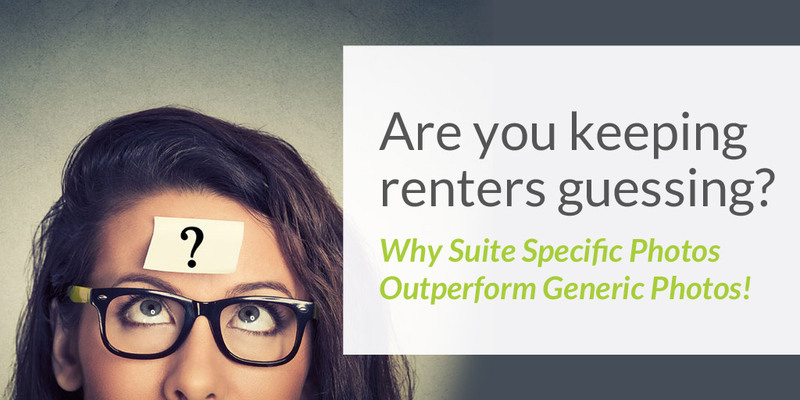 The very definition of "generic" is having the characteristic of or relating to a class or group of things; not specific: Translation: generic suite photos can make your property appear common and thus fail to inspire potential renters, leading to fewer leads and/or leases. Many vacation resorts are guilty of the same advertising practice Canadian apartment marketers are. They show mostly generic property photos and steer clear of suite specific photos. While this may not prevent you from choosing a resort, your expectations are set, based on the pictures you viewed. We all have that one terrible tale to tell, where reality did not live up to the expectation. Booking a vacation with your suite sight-unseen is one thing, choosing your home is another. Property managers that offer crisp, clear photos of their specific suites, demonstrate transparency and build trust, thus increasing their chances of closing the sale. Prospects who are shown exactly what they expect to see and have already expressed interest in, are much more likely to say yes, than those who need to take time to determine if the space is right for them after seeing it in person. The side benefit here is less tire kicking and more lease signing! We've come a long way in the last 2-3 years. In the past, detailed photography was expensive and laborious and much of the technology available in the market didn't have the ability to show and manage individual units on a website. Photography is now more accessible and affordable and the technology to manage and display suite specific photos across multiple platforms is readily available. Many of the leading listing sites now accommodate suite specific photos which gives you further incentive to show your properties with them. Generic suite photos are trending out, while suite specific photos are becoming the preferred method of unit advertising. Your competitors are buying in, are you? Read our blog post about our Suites Photos Manager and New Photo Uploader.